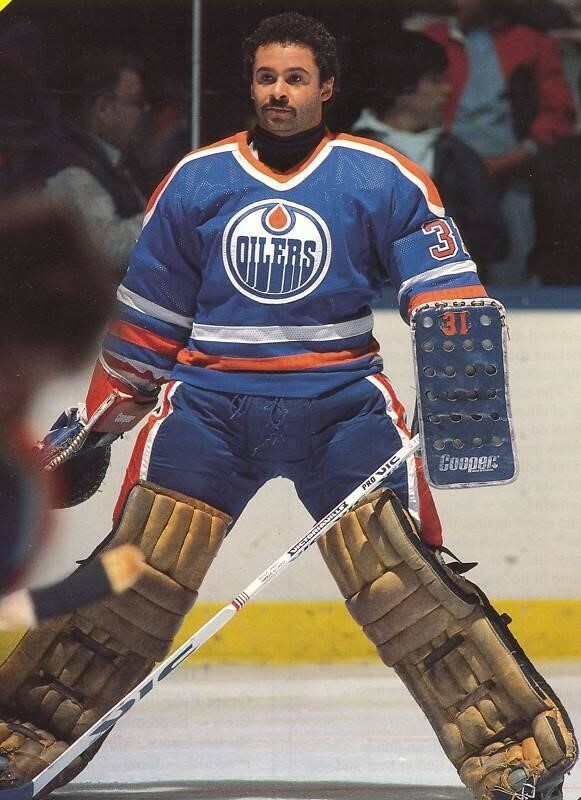 Grant Fuhr, a retired ice hockey goalie, was the first black superstar of the National Hockey League. Born on September 22, 1962 in Alberta, Canada to teenage parents who gave him up for adoption. His adoptive white parents—Robert Fuhr, an insurance agent, and Betty Wheeler—raised him in Spruce Grove, a small town near Edmonton, Alberta, Canada. As a hockey fan, he announced his attention to become a hockey goalie at age seven. His father obliged and transformed the family’s basement into a hockey rink. At age 17, Fuhr dropped out of Composite High School to play for the Victoria Cougars, a junior hockey team in British Columbia. His exceptional athletic abilities and poise was recognized by the Edmonton Oilers, a professional team in the National Hockey League (NHL). They immediately signed him to a contract as their first draft pick. In his rookie year with the Oilers (1982-1983 season), Fuhr was selected a Second-Team All-American. His superior performance as goaltender insured that the Oilers, already endowed with an explosive offense, would have a solid and dependable defense for years to come. With Fuhr blocking the opponents’ pucks, the Oilers won the Stanley Cup five times between 1984 and 1990. He was also instrumental in the Canadian national hockey team’s defeat of Russia’s national team in 1987. In the same year, he won the Vezina Trophy for his exceptional performance as the NHL’s premier goaltender. Despite much success, Fuhr battled a drug addiction. In 1990, Fuhr confessed to having a serious illicit drug problem—specifically cocaine—which his ex-wife Corrine confirmed. Upon hearing the news, NHL President John Ziegler suspended him from play for a year, which was later modified to a 55-game suspension. A series of trade arrangements followed in the wake of the disciplinary action. In 1991, he was traded to the Toronto Maple Leafs, the Buffalo Sabres in 1992, the Los Angeles Kings and the St. Louis Blues in 1995, and finally the Calgary Flames in 1999. In the American Hockey League (AHL), he played briefly for the Moncton Alpines, Cape Breton Oilers, Rochester Americans, and the St. John Flames. Fuhr continued to excel and break national hockey records. He won the 1993-1994 William M. Jennings Trophy for allowing the fewest goal scores. He was named to nine All-Star hockey teams and played on five Stanley Cup teams. In 2003, the Edmonton Oilers retired his jersey, number 31. He was inducted into the Hockey Hall of Fame. Considered by hockey superstar Wayne Gretzky as the greatest goaltender in NHL history, Fuhr continues to hold several goaltending records including the most consecutive appearances in a single season by a goaltender (76 in 1996). In September 2000, he retired as a professional hockey player and worked as a goaltending coach for the Calgary Flames from 2000 to 2002 and the Phoenix Coyotes from 2004 until 2009. Since 2014, Fuhr has been both a part owner and Director of Golf at Desert Dunes Golf Club in Desert Hot Springs, California. Also, in 2014, he married his third wife. He has five children: three daughters, a son, and a stepdaughter. Nathan Aaseng, “Fuhr, Grant Scott,” in African-American Athletes (Infobase Publishing, 2014); Judd Spicer, “Grant Fuhr’s Next Big Save,” at http://www.foremagazine.com/grant-fuhrs-next-big-save-from-hockey-rinks-to-desert-links-a-legendary-goalie-makes-his-mark/; Grant Fuhr Biography site at http://grantfuhr31.com/biography/; Profile on “The Daily Dose” site at http://dailydsports.com/grant-fuhr/.